The view from beautiful Isle Madame. Isle Madame sounds like the name of one island but it’s actually several, set on the southeastern tip of Cape Breton. 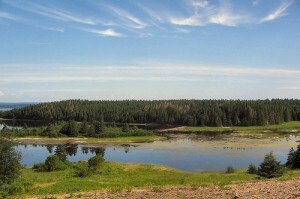 Getting here is an easy side trip from the town of St. Peter’s as you’re circuiting the Bras d’Or Lakes or heading between the Canso causeway and the Fortress of Louisbourg. The reward for your efforts is the chance to discover a mostly-French speaking area, which includes the village of Arichat, one of Nova Scotia’s oldest communities. In its 18th century heyday, Arichat was a key port for tall ships and had no less than 17 consular representatives! It’s a far quieter place now. There’s an Acadian-built cathedral to admire, many lookout points over the water and the LeNoir Forge Museum, a restored blacksmith’s shop from 1793. Close to Arichat, the Duke of York Cranberry Meadow is a farm that’s been growing cranberries since 1892. Drop in for a taste and a tour. As with so many places in Cape Breton, you’ll find no shortage of hiking trails and chances to hit the water in a canoe or kayak in this region.